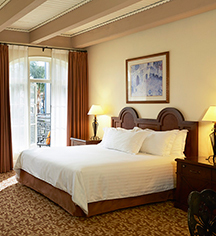 For additional space, each Suite at The Mission Inn Hotel & Spa affords travelers elegantly-appointed interiors coupled with timeless furnishings. Majestic in size, these architecturally-unique suites offer incredible views of the Spanish Patio or Alhambra Court, with some suites featuring spacious outdoor patios. 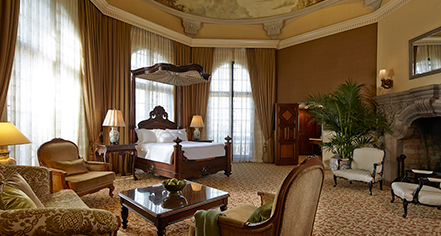 The five Presidential Suites range from 550 to 850 sq ft and are each one of a kind. Located throughout the first, second and third floors of the hotel, Junior Suites range from 550 to 700 sq ft and feature oversized sleeping rooms alongside separate sitting areas. Junior Suites boast unparalleled views of the pool, the Main Street Pedestrian Mall, the Oriental Courtyard, the Spanish Patio or Las Campanas.